Let your hydraulic system do the work for you! When equipped with our HD-1100A Automatic Kit, you are in complete control from the tractor seat. Back the unit up until the wings position themselves in line with the center boom. Lower the sections to the ground with your hydraulic system. You are now ready to harrow. Raise the sections to vertical position. Drive forward and the wings will pull into transport position and you are ready to hit the road. Now, if you so desire, you can save around $650 by omitting the HD-1100A Automatic Pull Cable Kit. 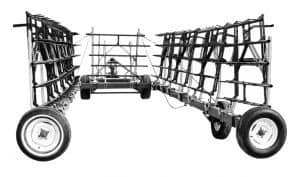 This will make the unit Semi-Automatic, which means when you are in transport, you will have to get off the tractor to remove the cables from the section lift arm hooks and put the pull cable eyes in the pull cable plate at the front of the harrow cart before opening the unit. When going from field position into transport position, you will again need to get off of the tractor and pull the pins back out of the pull cable plate and hang the cables on the section lift arm hooks before pulling the unit forward into transport mode. This is obviously an option, but we truly feel your needs are best served with the Automatic Kit. 46-965 Hydraulic Drawbar with 6 channel cart sides for extra strength and a 16 Hydraulic cylinder are standard equipment. 46-960, 46-965 and 46-1165 are one section wide in transport position. All units are available with the HD-1100A Automatic Kit.